Taco Bueno has added new flame-grilled items to their menu, including Fajita Tacos, Gourmet Burritos and Gourmet Bowls. These items can be ordered with either flame-grilled chicken or steak. There are also 2 new low-fat, vegetarian side items: Black beans and Cilantro Lime Rice. Taco Bueno Senior Vice President of Marketing Scott Terraciano-Spence says, "Taco Bueno is proving its commitment to scratch cooking by adding flame grills to our restaurants. Many other quick-serve brands advertise grilled products, but all too often the 'grilling' takes place in a faraway factory. 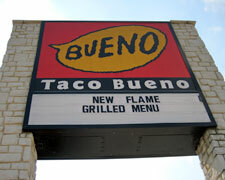 At Bueno, the new fajita steak and chicken are cooked over fire all day long at each of our units." Taco Bueno is installing the flame grills in all their restaurants for the new menu and all stores should be equipped by the end of September. These photographs were taken at a Taco Bueno in Granbury, TX. No nutritional information yet, but check back, we're trying to get it.